Saudi Prince Warns: $100-A-Barrel Oil ‘Never’ Again! The Game Is Rigged! Not to be confused with Malaysian gas company Petronas. Petrobras Distribuidora, Transpetro,Petrobras Argentina, Braskemamong others. Petróleo Brasileiro S.A. or Petrobras (Portuguese pronunciation: [ˌpɛtɾoˈbɾas]) is a semi-public Brazilianmultinational energy corporation headquartered in Rio de Janeiro, Brazil. It is the largest company in the Southern Hemisphere by market capitalization and the largest in Latin America measured by 2011 revenues. 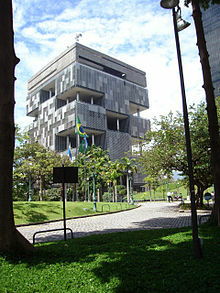 Petrobras was founded in 1953. While the company ceased to be Brazil’s legal monopolist in the oil industry in 1997, it remains a significant oil producer, with output of more than 2 million barrels (320,000 m3) of oil equivalent per day. The company owns oil refineries, oil tankers, and is a major distributor of oil products. Petrobras is a world leader in development of advanced technology from deep-water and ultra-deep water oil production. Petrobras headquarters in downtown Rio de Janeiro. Petrobras controls significant oil and energy assets in 18 countries in Africa, North America, South America, Europe, and Asia. These holdings as well as properties in Brazil give it total assets of $137.3 billion (2012). Petrobras is Latin America’s largest company with 2008 sales of $118.3 billion, according to a ranking from Latin Business Chronicle over Latin America’s Top 500 Companies. The Brazilian government directly owns 54 percent of Petrobras’ common shares with voting rights, while the Brazilian Development Bank and Brazil’s Sovereign Wealth Fund (Fundo Soberano) each control 5 percent, bringing the State’s direct and indirect ownership to 64 percent. The privately held shares are traded on BM&F Bovespa, where they are part of the Ibovespa index. Petrobras began processing oil shale in 1953, developing Petrosix technology for extracting oil from oil shale. An industrial size retort began processing shale in the 1990s. In 2006, Petrobras claimed that this industrial retort had a design capacity to process 260 tonnes/hour of oil shale. Petrobras operated the world’s largest oil platform — the Petrobras 36 Oil Platform – until an explosion on 15 March 2001 led to its sinking on 20 March 2001. P-36 was replaced by FPSO-Brasil. In 2007, Petrobras inaugurated the Petrobras 52 Oil Platform. The 52 is the biggest Brazilian oil platform and third in the world. Petrobras is also recognized as the largest sponsor of arts, culture, and environmental protection in Brazil. Among the environmental initiatives, Petrobras is the main supporter of whale conservation and research through the Brazilian Right Whale Project and the Instituto Baleia Jubarte (Brazilian Humpback Whale Institute). Petrobras has been a sponsor of the Williams Formula-1 team. The company employs the H-Bio process to produce biodiesel. According to Forbes, as of April 2011, Petrobras is the 8th largest company in the world. 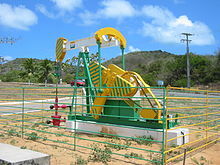 Petrobras standard model for its land oil pump, popularly known as Wooden Horse (Cavalo de Pau in Portuguese) in UFRN, Natal, Brazil. Skyscraper hosting Petrobras’ offices in Paulista Avenue, São Paulo. Petrobras was created in 1953 during the government of Brazilian president Getúlio Vargas, with the support of both the ruling parties and the opposition alike in Congress. However, with the creation of a new government the following year, opposition from the government emerged to Petrobras. Petrobras commenced its activities with the collection it inherited from the old National Oil Council (pt) (Conselho Nacional do Petróleo, CNP), which, however, preserved its inspection function for the sector. The oil exploration and production operations, as well as the remaining activities connected to the oil, natural gas, and derivative sector, except for wholesale distribution and retail via service stations, were a monopoly Petrobras held from 1954 to 1997. Early on, in 1961, it was hurt by a pessimistic government report concerning oil prospects in Brazil. Two years after the report’s release, Petrobras created its research center Cenpes. Unfortunately, only ten years later, the company’s period of growth was halted by the 1973 oil crisis. The entire country was affected, and the “Brazilian miracle”, a period of rapid growth in the economy ended. Petrobras itself nearly went bankrupt. But, then, a year later, the company discovered an oil field in Bacia de Campos. This discovery boosted its finances and helped it restructure nationwide. In 1975, Petrobras signed contracts partnering with private oil contracts concerning exploration for more oilfields in Brazil. The company was also affected by the 1979 energy crisis, but not as bad as in 1973. During this period, Petrobras became the leader in derivative marketing in Brazil, and, thanks to the company’s performance, it was awarded the Offshore Technology Conference (OTC) in 1992, one which it was granted again in 2001. After 40 years of exploration, production, refining, and transportation of Brazil’s oil, Petrobras started to compete with other foreign and domestic companies in 1997 when the government approved Law N.9.478. This law broke Petrobras’s monopoly and allowed for competitors to develop Brazil’s oilfields. 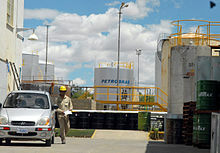 The Brazilian government also created the National Petroleum Agency (Agência Nacional do Petróleo, ANP), responsible for the regulation and supervision of activities in the petroleum industry, and the National Council of Energy Policies, a public agency responsible for the development of public energy policy. That same year, Petrobras reached the mark of producing 1 million barrels (160,000 m3) per day. The company also executed agreements with other Latin American governments and began operations outside of Brazilian domains. In 2000, Petrobras achieved a world record for oil exploration in deep waters. The exploration reached a depth of 1,877 metres (6,158 ft) below sea level. The following year, an accident at the P-36 Platform, the world’s largest oil platform, caused it sink on March 20. Petrobras lost about 1,500 tons of oil from this one accident alone. In 2003, commemorating its 50 years, Petrobras doubled its daily production of oil and natural gas, surpassing the mark of 2 million barrels (320,000 m3). That same year, it acquired the Argentine company Perez Companc Energía (PECOM Energía S.A.). This acquisition also included bases in Bolivia, Peru, and Paraguay. Two years later, on December 19, 2005, Petrobras announced a contract with the Japanese Nippon Alcohol Hanbai to launch a joint-venture. The project, namedBrazil-Japan Ethanol, would import ethanol from Brazil, in a bid to develop an ethanol market in Japan. On April 21, 2006, the company started production on the P-50 oil platform, in the Albacora East Field at Campos Basin, which gave Brazil self-sufficiency in oil production. The following year, the Tupi oil field in the Santos Basin was discovered. This field could possibly be the world’s largest. In 2008, Petrobras announced the discovery of the Jupiter field, off the coast of Rio de Janeiro. The following year, Petrobras discovered what is possibly the world’s third largest oil field in the State of São Paulo. However, no evidence has been shown for this so far. In 2009, Petrobras announced a market capitalization plan to finance its future investments in ultra-deep oil exploration. The share offering in the BM&F Bovespa Stock Exchange took place in September 2010, becoming the largest market capitalization in history, with R$ 120,4 billion (US$69,97 billion) in shares issued. In 2009, it also acquired Esso‘s Chilean business. Petrobras also finalized a $10 billion loan from China in return for a ten years long supply of oil (150,000 barrels (24,000 m3) a day the first year, 200,000 barrels (32,000 m3) a day the nine others). Petrobras represented 24 percent of the Bolivian industrial taxes, 18 percent of the country’s GDP and 20 percent of the foreign investments. The company operated in 46 percent of the oil reserves in Bolivia and was responsible for 75 percent of the country’s gas exports to Brazil. The company invested, between 1994 and 2005, US$1.5 billion in the Bolivian economy. The nationalization strained the relationship between Petrobras and the Bolivian government. On October 28, 2006, after a long negotiation, Petrobras and Bolivia signed an agreement, whereby the company would take 18 percent of the profits, and the Bolivian government would take the remainder. 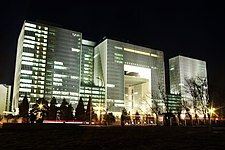 It emerged in September 2013 that the US government had been allegedly spying on Petrobras after Organizações Globo reported the claims on national television. The information was reportedly provided by US journalist Glenn Greenwald. Petrobras announced that it was investing R$21 billion over five years to improve its data security. Petrobras’ most important assets are petroleum reserves in Brazil. Its oil field in the Campos Basin accounts more than 80 percent of the Brazilian oil production. The company also works on developing “green energy”, including biodiesel fuel. Petrobras recently opened its business to the ethanol fuel, facing great competition against the North American ethanol. However, investment in biofuels will represent only 1 percent of the company’s profit between 2008 and 2012. The company began to increase profits from 2002, with the government’s heavy investments. In the first quarter of 2008, Petrobras reached the market value of US$295.6 billion, surpassing companies such as Microsoft, BP, and Chevron-Texaco, but behind ExxonMobil and General Electric. Petrobras’ market value is also larger than Industrial and Commercial Bank of China, making it the sixth largest company by market value in the world. Foreign exchange gains: The company imports natural gas from other South American countries, mostly from Bolivia. According to the Brazilian group National Petroleum Agency, Petrobras owns Brazil’s largest and most important gas pipe network, having a near monopoly of the natural gas marketed in the country. Rising prices: the company profited from rising oil prices in 2007-2008. Increasing demand: oil demand has increased drastically in the emergent countries, for which Petrobras exports its technologies. The BRIC countries’ (Brazil itself, Russia, India and China) growth explains this huge demand. The Brazilian self-sufficiency in Petroleum (as of May 2006) allowed the company to export small quantities of oil. Political issues: despite of being nearly half privately owned, the majority of shares belong to the Brazilian government, which gives it control of the company’s finances and operations. The recent growth of the company is explained by political stability. Since 1997 the Brazilian oil market was opened to foreign investments, but Petrobras continues to be the largest oil company in the country, enjoying a near monopoly. At the 20th National Forum, it was revealed that Petrobras, with 11.7 billion barrels (1.86×109 m3) of oil, has the fourth biggest oil reserves among petrochemical companies with publicly traded shares. The figure does not include the recent discoveries in the mega-fields of Tupi, Jupiter, Carioca and Bem-te-vi. The discovery of large reserves in Santos Basin increased its stock price by about 19 percent in one day. Petrobras is considered the most reliable Blue Chip of the Bovespa Stock Exchange. While the North American Crisis of 2007 decreased the value of the stocks of a great majority of STOCK MARKETS in the world, Petrobras helped hold the Bovespa’s activities steady, making it one of the least affected stock exchanges in the world by the crisis. On 30 April 2008, Brazil received an “investment grade” rating from Standard & Poor’s, given to countries with stable and consistent growing economy. According toStandard & Poor’s, Brazil jumped from a BB+ grade to a BBB-, the minimum level any country needs to reach to receive the grade. Petrobras played a big part in the country’s growth, and the high rating would be useful in attracting foreign investments. Investors often criticize the company for not increasing gasoline prices in Brazil, in spite of increasing prices in the international market. The company is having problems adapting its business to the ethanol market. After a great advance on its stock shares (reaching 52.30 Brazilian real (R$) in Ibovespa) in May 2008, Petrobras faced a devaluation in the following month, its shares decreasing to R$43.90 on 19 June 2008. The most probable explanation for the great fall was the lack of information about the mega-fields recently discovered by the company. The great instability in Wall Street‘s markets also had great weight in those results. Petrobras’ fall also led to bad results on the entire BM&F Bovespa, as Petrobras and Vale accounted for more than 25% of BM&F Bovespa‘s trade value, the devaluation of those companies’ shares led it to lose more than 6,000 points in just 25 days. However, with the continuous decrease of oil prices, Petrobras’ stock shares fell to R$33,00 on 14 August 2008. Its market cap presented the biggest loss of value in the Americas, with US$93 billion (13 August 2008). Petrobras doubled its success rate at drilling new wells, 2002–5. November 25, 2008 Jequitinhonha BM-J-3 ? January 26, 2009 Santos Piracucá ? April 8, 2009 Santos Corcovado-1 ? The company’s most important discoveries started at the end of 2007, when the first mega-field, named Tupi, was found at a depth of 5,000 meters below the sea level, the first discovery of the company in the pre-salt layer. The second discovery was announced on January 21, 2008: the new mega-field was named Jupiterand had the same size as Tupi. The company revealed no more information about the field, forcing many investors to regard those facts as an “industrial secret”. On May 21, 2008, the company announced the discovery of a third oil megafield, located 250 km distant from the state of São Paulo, at a depth between 6000 and 6300 meters below sea level. The discovery was made by a consortium formed by Petrobras (66 percent of participation), Shell (20 percent) and Galp Energia(14 percent). The field’s oil reserves had an API gravity between 25 and 28. According to the Brazilian economy website InfoMoney.com, North American stock companies are considering the oil mega-field discoveries suspicious. On May 24, 2008, the company’s shares fell 4 percent because of the scarce information given by Petrobras about the fields. Despite the incredible advance of 14 percent in Petrobras stock shares after the discovery of Tupi and Jupiter fields, the North American answer for the shares was the worst possible. Petrobras’ ADR’s — American Depositary Receipts — fell more than 4 percent in New York. It seems that the market is interpreting the discovery with mistrust. (…) Everyone knows that the potential of the fields is huge, but that stills being only a “potential”. No concrete information about the fields’ capacity has been released at any time. These are only expectations, which still face a great technological challenge to the exploration of so deep deposits, which may even make this exploration unfeasible. By the end of 2003, Petrobras subscribed to the United Nations Global Compact, a voluntary agreement which encompasses a set of principles regarding human rights, working conditions and the environment. The company’s growth since 2006 has made Petrobras the most profitable company in the Brazilian economy, and gave it great importance worldwide, being recognized as the eighth biggest oil exploring company in the world. Since 2006 Petrobras has been listed in the Dow Jones Sustainability Index, an important reference index for environmentally and socially responsible investors. On February 25, 2008, the Spanish consultancy firmManagement and Excellence acknowledged Petrobras as the world’s most sustainable oil company. The civil society named Transparency International, which fights against global corruption, published a list on April 28, 2008 containing the names of 42 companies with high transparency levels, in which Petrobras was included. In May 2008, World Trademark Review magazine awarded the Petrobras trademark team with an Industry Award for Latin American Team of the Year, a category in which Petrobras competed with Coca-Cola, Pepsico, and Procter and Gamble. Petrobras global operations extends over 27 countries (including Brazil). Those operations are more related to diplomatic trades than oil exploration, although the company has important fields in India, Turkey, Angola and Nigeria. The most important countries for commercial agreements are Japan, United Kingdom and China. The complete map can be seen in Petrobras official link Petrobras Worldwide. In June 2010, Petrobras was granted a five-year permit for exploration of the Raukumara Basin, off the East Cape of New Zealand. April 2011 and the Orient Explorer began surveying off the east coast of New Zealand’s North Island. Greenpeace protestors, in opposition to the deal between the New Zealand government and Petrobras, attempted to halt the work by swimming in front of the survey ship. Local Maori felt the risk to the local waters and fish stocks, should oil be found and drilling go ahead, was too high a price and that better consultation with local people was required. In 2012 Petrobras returned their exploration licences amidst their “annus horribilis“. Petrobras maintains a high budget to fund Brazil’s cultural production, such as films, theatre plays and scholarly works. It is the largest sponsor of culture in Brazil since the 1990s. In the Speed Racer live-action movie, one of the cars featured is the “Green Energy”, a biodiesel fueled racing car sponsored by Petrobras. Petrobras is the main sponsor of the Brazilian Série A.
Petrobras was a secondary sponsor for the AT&T WilliamsF1 Team from 1998 to 2008 and has resigned with Williams F1 from 2014 onwards. Petrobras was a sponsor for Flamengo in Brazil from 1984 to 2009. The sauropod dinosaur Petrobrasaurus is named after this company. For the Byzantine nobleman and general, see Petronas (general). Not to be confused with the Brazilian oil company Petrobras. PETRONAS, short for Petroliam Nasional Berhad, is a Malaysian oil and gas company that was founded on 17 August 1974. Wholly owned by the Government of Malaysia, the corporation is vested with the entire oil and gas resources in Malaysia and is entrusted with the responsibility of developing and adding value to these resources. PETRONAS is ranked among Fortune Global 500‘s largest corporations in the world. Fortune ranks PETRONAS as the 75th largest company in the world in 2013. 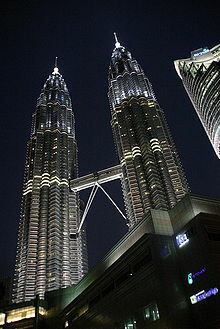 It also ranks PETRONAS as the 12th most profitable company in the world and the most profitable in Asia. Since its incorporation, PETRONAS has grown to be an integrated international oil and gas company with business interests in 35 countries. As of the end of March 2005, the PETRONAS Group comprised 103 wholly owned subsidiaries, 19 partly owned outfits and 57 associated companies. Together, these companies make the PETRONAS Group, which is involved in various oil and gas based activities. The Financial Times has identified PETRONAS as one of the “new seven sisters“: the most influential and mainly state-owned national oil and gas companies from countries outside the OECD. The group is engaged in a wide spectrum of petroleum activities, including upstream exploration and production of oil and gas to downstream oil refining; marketing and distribution of petroleum products; trading; gas processing andliquefaction; gas transmission pipeline network operations; marketing of liquefied natural gas; petrochemicalmanufacturing and marketing; shipping; automotive engineering; and property investment. PETRONAS provides a substantial source of income for the Malaysian government, with 45% of the government’s budget dependent on PETRONAS’ dividend, moreover in 2011 government real balance has 5 percent deficit of Gross Domestic Product. The company is headquartered at the Petronas Towers which was officially opened on Malaysia’s 42nd National Day, 31 August 1998 – in the corporation’s 24th Anniversary year. PETRONAS was not the first company to extract oil or gas in Malaysia. It was Royal Dutch Shell that began the oil exploration in Sarawak, then under the White Rajahs, at the end of the 19th century. In 1910, the first oil well was drilled in Miri, Sarawak. This became the first oil producing well known as the Grand Old Lady. Shell was still the only oil company in the area in 1963, when the Federation of Malaya, having achieved independence from Britain six years before, united with Sarawak and Sabah, both on the island of Borneo, and became Malaysia. The authorities in the two new states retained their links with Royal Dutch Shell, which brought Malaysia’s first offshore oil field onstream in 1968. Meanwhile, the federal government turned to Esso, Continental Oil, and Mobil, licensing exploration off the state of Terengganu, in the Malay Peninsula, the most populous region and the focus of federal power. By 1974, however, only Esso was still in the area. It made its first discoveries of natural gas in that year and then rapidly made Terengganu a bigger producer of oil than either Sarawak or Sabah. By 1974, Malaysia’s output of crude oil stood at about 81,000 barrels per day (12,900 m3/d). Several factors converged in the early 1970s to prompt the Malaysian government into setting up a state oil and gas company, as first proposed in its Five Year Plan published in 1971. Former Chief Minister of Sarawak, Tun Abdul Rahman Ya’kub was one of the people who proposed the idea of Malaysia setting up their own oil company. These were years in which power in the world oil industry began to shift away from the majors, which then controlled more than 90% of the oil trade, toward the Organization of Petroleum Exporting Countries (OPEC), as well as a proliferation of new private and state companies joining in the search for reserves. By 1985, the majors, reduced in number from seven to five, were producing less than 20% of the world total. It seemed that Malaysia would either have to join the trend or continue to leave its oil and gas entirely to Royal Dutch/Shell and Esso, multinational corporations necessarily attuned to the requirements of their directors and shareholders, rather than to the priorities the government of a developing country might seek to realise. Further, an agreement between Malaysia and Indonesia, signed in 1969, had settled doubts and disputes about each country’s claims over territorial waters and offshore resources at a time when both were heavily indebted to Organization for Economic Co-operation and Development (OECD) governments and banks as well as to the International Monetary Fund (IMF) and the World Bank. Setting up a state oil and gas company, through which the government could get international capital but avoid tangling with foreign oil companies or governments, had worked for Indonesia: why not for Malaysia as well? The oil crisis of 1973–74 made the government even more aware of Malaysia’s dependence on foreign oil and foreign capital in general. Another factor in the decision was that the technology had recently been developed for extensive exploration and drilling offshore. The local geography included a combination of broad basins of sedimentary rock with calm and shallow waters around the Sunda Shelf, making exploration for gas and oil relatively easier and more successful than in most areas of the world. Malaysian crude turned out to be mostly high quality with low sulphur content. A final and crucial factor in the creation of PETRONAS, and its continuation in much the same form since, has been the political stability of Malaysia. Since the restoration of parliament in 1971, the country has been ruled by the National Front (Barisan Nasional), the heirs to the Alliance Party which had been dominant from 1957 to 1969 and the originators in 1971 of the New Economic Policy, which was designed to improve the economic position of Bumiputras—native Malays and other natives in Sabah and Sarawak—relative to Chinese and Indian Malaysians and to foreign corporations. The difficulties this policy has caused for foreign companies and investors are outweighed by the benefits they believe they gain from Malaysia’s political stability. The Malaysian government chose to create a state company, rather than using taxes, production limits, leasing, or other familiar instruments of supervision. The government wanted, and needed, the co-operation of the majors but also sought to assert national rights over the use of the country’s resources. A state company, having both supervisory powers over the majors and production activities of its own, was a workable compromise between allowing the majors full rein and excluding them, along with their capital and expertise, altogether. PETRONAS was established in August 1974 and operates under the terms of the Petroleum Development Act passed in October 1974. It was modelled onPertamina, the Indonesian state oil and gas company founded in 1971 in succession to Permina, which had been set up in 1958. According to the 1971 plan, PETRONAS’ goals would be to safeguard national sovereignty over oil and gas reserves, to plan for both present and future national need for oil and gas, to take part in distributing and marketing petroleum and petrochemical products at reasonable prices, to encourage provision of plant, equipment, and services by Malaysian companies, to produce nitrogenous fertilizers, and to spread the benefits of the petroleum industry throughout the nation. On 6 September 1974, Malaysia’s then prime minister, Tun Abdul Razak, announced the appointment of Tengku Razaleigh Hamzah as chairman and chief executive of PETRONAS. Tun Razak said: “From among the new blood, I intended to bring Tengku Razaleigh into the Cabinet. However, I have an important job for him, a job as important as that of a Cabinet Minister. I have decided to appoint him as chairman and chief executive of PETRONAS, which is equivalent to being a Cabinet Minister.”. Subsequently, Razaleigh had to relinquish his job as Chairman of PERNAS which he held from 1970, but retained the chairmanship of Bank Bumiputra. Having created PETRONAS, the government had to choose what forms its dealings with private oil companies would take. Starting with its legal monopoly on oil and gas activities and resources, it had several options: it could simply award concessions without taking part in production, management, or profits; it could try offering services at the supply end; or it could make contracts to cover profit-sharing, production-sharing, joint ventures—sharing both profits and costs—or all stages of the process, under “carried-interest” contracts. PETRONAS’ first move was to negotiate the replacement of the leases granted to Royal Dutch/Shell on Borneo and to Esso in THE PENINSULA with production-sharing contracts, which have been the favoured instrument, alongside joint ventures, ever since. These first contracts came into effect in 1976. Allowing for royalties to both federal and state governments, and for cost recovery arrangements, they laid down that the remainder would go 70% to PETRONAS and 30% to the foreign company. Esso began oil production in two offshore fields in 1978, exporting its share of the supply, unlike PETRONAS, whose share was consumed within the country. Also in 1976, Malaysia became a net exporter of oil, but exports were at such a low level as to make the country ineligible to join OPEC. This situation benefited Malaysia, and PETRONAS, by allowing the company a degree of commercial and political flexibility and reinforcing PETRONAS’ chief purpose, Malaysian self-reliance. PETRONAS supervised its foreign partners’ oil activities, taking no direct role in production until 1978, when the government saw to the creation of a subsidiary for oil exploration and production, PETRONAS Carigali. It began its work in an oil field off THE PENINSULA . PETRONAS retained its supervisory powers over all oil and gas ventures, particularly on issues of health and safety and environmental control. The government was determined to develop Malaysia’s natural gas as well as its oil Shipping Company (MISC), of which it owned 61%. These were to take LNG exports out of Malaysia, save the cost of hiring foreign tankers, and expand the country’s fleet under its own control—in contrast to cargo shipping, which was controlled by international conferences. Shell BV, the Royal Dutch/Shell subsidiary that was building the LNG plant off Sarawak with Japanese and Asian Development Bank aid, accepted production sharing with PETRONAS but baulked at sharing equity, transport management, or refining. Negotiations went on, pushing commencement further and further back, until 1977, when PETRONAS and the government, faced with the costs of maintaining the tankers between delivery and first use, surrendered management rights—leading to a repeal of part of the Petroleum Development Act—and settled for PETRONAS’ taking 60% of equity in the new company Malaysia LNG. The Sarawak state government took 5%, and the other 35% was divided equally between Shell BV and the Mitsubishi Corporation. Production of LNG in Sarawak at last began in 1983. When in 1982 PETRONAS Carigali formed an exploration and production company with Société National Elf Aquitaine of France, it allowed Elf better terms for recovering costs than it had offered in earlier ventures. This development came against the background of the government’s imposition of a depletion policy on PETRONAS, Royal Dutch Shell, and Esso in trying to postpone the exhaustion of oil reserves. These were then estimated to be about 2.84 billion barrels (452,000,000 m3), and it was officially predicted that by the late 1980s Malaysia would be a net oil importer once again. By 1980, oil and gas already represented 24% of Malaysian exports, and the government decided to impose a tax on these exports at a 25% rate. The new policy and the new tax combined to cause Malaysia’s output and exports of crude oil to fall in 1981 for the first time since PETRONAS was established. Output rose again, beyond its 1980 level, in the following year, but exports took until 1984 to surpass their 1980 level. PETRONAS went into refining and distribution in 1983. It initiated the construction of refineries at Malacca and at Kerteh to reduce its dependence on Royal Dutch/Shell’s two refineries at Port Dickson and Esso’s refinery in Sarawak. These two majors, and other foreign companies, already covered much of the domestic retail market, but the new subsidiary PETRONAS Dagangan was given the initial advantage of preference in the location of its stations. By 1990, 252 service stations carried the PETRONAS brand, all but 20 on a franchise basis, and another 50 were planned. Some were set up on grounds of social benefit rather than of strict commercial calculation. As production from Royal Dutch/Shell and Esso’s existing fields moved nearer depletion, the companies sought new fields and new contracts. In 1985, the government and PETRONAS revised the standard production-sharing contract, increasing the rate of recovery of capital costs from 30% to 50% of gross production in the case of oil and from 35% to 60% in the case of natural gas, abolishing signature, discovery, and production bonus payments and increasing the foreign partners’ share of the profits. At first the drastic fall in oil prices during 1986, which cut Malaysia’s income from exported oil by more than a third even though the volume of exports rose by 16%, discouraged interest in the new arrangements, but by 1989 PETRONAS had signed 22 new contracts with 31 companies from 11 countries. However, the contract period was still restricted to five years—compared, such as, with the 35-year contracts available in neighbouring Singapore—and there was still a 25% levy on exported crude oil, a measure that was intended to promote the domestic refining industry. These conditions, cited as disincentives to foreign investment, were eventually relaxed over the next several years. The government and PETRONAS aimed to encourage the replacement of fast-depleting oil within Malaysia itself and simultaneously to foster heavy industries which could help reduce the country’s overwhelming dependence on exporting its natural resources. In 1980, petroleum products accounted for 88% of the country’s commercial consumption of energy, the rest being provided from hydroelectric plants in Sarawak, too far away from the main population centres to become a major alternative. Five years later, gas accounted for 17%, hydroelectricity for 19%, coal for 2%, and petroleum products for 62% of such consumption, and about half of each year’s gas output was being consumed in Malaysia. The PETRONAS venture responsible for this shift in fuel use, and—along with Malaysia LNG—for Malaysia’s becoming the third largest producer of LNG in the world, was the Peninsular Gas Utilization Project (Projek Penggunaan Gas Semenanjung), the aim of which was to supply gas to every part of THE PENINSULA . Its first stage was completed in 1985, following the success of smaller gasification projects in the states of Sarawak and Sabah, and involved the extraction of gas from three fields in the Natuna Sea, between the Peninsula and the island of Borneo; its processing in a plant at Kertih on the Peninsula’s east coast; and its distribution to the state of Terengganu by pipeline and abroad via an export terminal. PETRONAS’ least happy venture was its ownership of the Bank Bumiputra, the second-largest, but least-profitable, of the commercial banks incorporated in Malaysia. PETRONAS spent more than MYR3.5 billion over five years trying to rescue the bank from the impact of the bad loans it had made, starting with its support of the Carrian property group of Hong Kong, which collapsed in 1985, taking the bank’s share capital down with it. In 1991, PETRONAS sold the bank back to another state company, Minister of Finance Inc., and announced its intention to concentrate on oil, gas, and associated activities in future. Just as PETRONAS was disposing of this liability, the crisis caused by the Iraqi regime’s invasion of Kuwait culminated in military action against Iraq on behalf of the United Nations. PETRONAS had already raised Malaysia’s oil production rate from 605,000 to 650,000 barrels per day (103,000 m3/d) in late 1990 as the crisis unfolded. This move only reinforced the company’s awareness of the need to vary its policies, since, with known reserves of 2.94 billion barrels (467,000,000 m3), and assuming no new major finds of oil, Malaysia risked seeing output decline to 350,000 barrels per day (56,000 m3/d) in 2000 and running down to depletion within another five years. This was exacerbated by the possibility that Southeast Asia in general would enjoy rapid economic growth in the 1990s, so that demand for oil there would rise twice as fast as demand in the relatively more sluggish, more mature economies of North America and Europe. The Malaysian government, and its state oil and gas company, was forced to decide what mixture of policies to adopt in response. Fortunately for Malaysia, exploration was by no means at an end and could yet produce more reserves. The Seligi field, which came onstream at the end of 1988 and was developed by Esso Production Malaysia, was one of the richest oilfields so far found in Malaysia waters, and further concessions to the majors would encourage exploration of the deeper waters around Malaysia, where unknown reserves could be discovered. Meanwhile, computerised seismography made it both feasible and commercially justifiable to re-explore fields which had been abandoned, or were assumed to be unproductive, over the past century. In 1990, PETRONAS invited foreign companies to re-explore parts of the sea off Sabah and Sarawak on the basis of new surveys using up-to-date techniques. Another way to postpone depletion was to develop sources of oil, and of its substitute, natural gas, outside Malaysia. Late in 1989, the governments of Vietnam andMyanmar (Burma) invited PETRONAS Carigali to take part in joint ventures to explore for oil in their coastal waters. In 1990, a new unit, PETRONAS Carigali Overseas Sdn Bhd, was created to take up a 15% interest in a field in Myanmar’s waters being explored by Idemitsu Myanmar Oil Exploration Co. Ltd., a subsidiary of the Japanese firm Idemitsu Oil Development Co. Ltd., in a production sharing arrangement with Myanma Oil and Gas Enterprise. Thus began PETRONAS’ first oil exploration outside Malaysia. In May 1990, the governments of Malaysia and Thailand settled a long-running dispute over their respective rights to an area of 7,300 square kilometres in the Gulf of Thailand by setting up a joint administrative authority for the area and encouraging a joint oil exploration project by PETRONAS, thePetroleum Authority of Thailand, and the US company Triton Oil. In a separate deal, in October 1990, the Petroleum Authority of Thailand arranged with PETRONAS to study the feasibility of transferring natural gas from this jointly administered area, through Malaysia to Thailand, by way of an extension of the pipelines laid for the third stage of the Peninsular Gas Utilization Project. That project was on course to becoming a major element in the postponement of oil depletion. Contracts for line pipes for the second stage of the project were signed in 1989 with two consortia of Malaysian, Japanese, and Brazilian companies. This stage, completed in 1991, included the laying of 730 kilometres of pipeline through to the tip of THE PENINSULA , from where gas could be sold to Singapore and Thailand; the conversion of two power stations—Port Dickson and Pasir Gudang—from oil to gas; and the expansion of PETRONAS’ output of methyl tert-butyl ether (MTBE), propylene, and polypropylene, which were already being produced in joint ventures with Idemitsu Petrochemical Co. of Japan and Neste Oy of Finland. The third and final stage of the project was to lay pipelines along the northwest and northeast coastlines of the Peninsula and was completed in 1997. Another new venture in 1990 was in ship-owning, since PETRONAS’ existing arrangements with MISC and with Nigeria’s state oil company would be inadequate to transport the additional exports of LNG due to start in 1994, under the contract with Saibu Gas. PETRONAS did not lose sight of the government’s commitment to Malaysian self-reliance, and the company’s second refinery at Malacca, completed in 1994, with a capacity of 100,000 barrels per day (16,000 m3/d), promoted the same policy. The fact that it was built in a joint venture with Samsung of Korea, the Chinese Petroleum Corporation of Taiwan, and Caltex of the United States did not negate the policy, for the subsidiary company PETRONAS Penapisan (Melaka) had a decisive 45% of equity while sharing the enormous costs of and gaining advanced technology for the project. More to the point, a side effect of the refinery’s completion was that PETRONAS was able to refine all of the crude oil it produced, instead of being partially dependent on refining facilities in Singapore. PETRONAS, with its policies of promoting self-reliance, helping to develop associated industries, and varying the sources and uses of oil and gas, played an important role in the Malaysian economy as a whole. 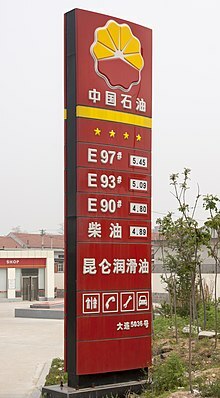 Under governments which—by current, if not historical, Western standards—were strongly interventionist, the contribution of oil taxes to the federal government’s revenue hovered at around 12% to 16% until 1980, when it showed a marked increase to 23%, followed by another leap to 32% in 1981. From then until 1988 the proportion fluctuated between 29% and 36%. PETRONAS was not just another big oil company: it controlled a crucial sector of the economy and remained, for better or worse, an indispensable instrument of the state. 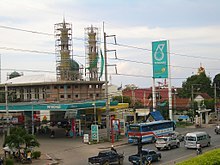 A Petronas station seen in Pattaya,Thailand. During the mid- to late 1990s, international exploration, development, and production remained key components in PETRONAS’ strategy along with diversification. A key discovery was made in the RUBY field in Vietnam in 1994. That year, the firm also saw its first overseas production from the Dai Hung field in Vietnam and established its first retail station outside of Malaysia in Cambodia. In 1995, a subsidiary was created to import, store, and distribute liquefied petroleum gas (LPG). In addition, the company’s polyethylene plant in Kerteh began operations. PETRONAS marked a significant milestone during this time period—two of its subsidiaries, PETRONAS Dagangan Bhd and PETRONAS Gas Bhd, went public on the Kuala Lumpur Stock Exchange. Between 1993 and 1996, it purchased the former sub-Saharaian branch of Mobil Oil, rebranded as Engen Petroleum. During 1997, PETRONAS heightened its diversification efforts. The firm set plans in motion to build three petrochemical plants in Kuantan as well as an acetic facility in Kerteh. Its first LPG joint venture in China was launched that year and the company acquired a 29.3% interest in Malaysia International Shipping Corporation Berhad (MISC). In 1998, PETRONAS’ tanker-related subsidiary merged with MISC, increasing PETRONAS’ stake in MISC to 62%. That year, PETRONAS introduced the Petronas E01, the country’s first commercial prototype engine. The company also signed a total of five new production sharing contracts (PSCs) in 1998 and 1999, and began oil production in the Sirri field in Iran. By 2003, Malaysia was set to usurp Algeria as the world’s second-largest producer of LNG with the completion of the Malaysia LNG Tiga Plant. Prime Minister Mahathir Mohamad commented on the achievement in a May 2003 Bernama News Agency article, claiming that “the PETRONAS LNG complex now serves as another shining example of a vision realized of a national aspiration, transformed into reality by the same belief among Malaysians that ‘we can do it. '” Indeed, PETRONAS had transformed itself into a global oil company over the previous decade, becoming a national symbol for success. The company realised, however, that it would have to continue its aggressive growth strategy to insure its survival in the years to come. In 2004, Minister in the Prime Minister’s Department, Datuk Mustapa Mohamed, stated that PETRONAS contributed RM 25 Billion to the country’s treasury accounting for 25% of revenue collected via dividends and other revenues. PETRONAS continuously provides the Malaysian government dividends from its profits. Since inception in 1974, PETRONAS have paid the government RM 403.3 billion, with RM 67.6 billion in 2008. The payment represents 44% of the 2008 federal government revenue. PETRONAS continues to focus on international exploration projects as 40% of revenue in 2008 was derived from international projects such as Iran, Sudan, Chad and Mauritania. The company’s international reserves stood at 6.24 billion barrels oil equivalent in 2008. On 29 October 2012, PETRONAS sources said it will renew a bid for gas producer Progress Energy Resources after Canada blocked its bid earlier this month. The $6-billion bid was approved by Ottawa on 7 December 2012. PETRONAS Logo was created in 1974 by Dato’ Johan Ariff of Johan Design Associates. He is also responsible in creating the Logo of many PETRONAS subsidiaries, JVs, link-companies and properties, including Kuala Lumpur City Centre (KLCC), MISC, MMHE, Universiti Teknologi PETRONAS (UTP), Kuala Lumpur Convention Centre, Putrajaya Holdings, Prince Court Medical Centre (PCMC), PETLIN, Malaysian Petroleum Club and Mesra Mall, to name a few. The basic structure is geometric, embodying metaphoric and alpha glyphic nuances of an oil drop and a typography ‘P’, the latter being evident in the triangle assigned at the top right corner. The triangle is also an essential element to define directional movement and dynamism. The placement of a solid circle in the Logo is interpretive if the wheel of the oil and gas industry while outline of the drop simulates a driving system, the energy which to be derived from oil. The Corporate Logotype named ‘Alpha PETRONAS’ is designed in uppercase exclusively for PETRONAS and its subsidiaries. Each alphabet is rendered with a rounded profile to assume fluidity and viscosity, while emphasising the oil based operation. PETRONAS recently introduced a refreshed version of its corporate logo at the 2013 Asia Oil and Gas Conference (AOGC 2013). A renewed “look and feel” has been incorporated to the original PETRONAS’ oil drop logo to reflect the visual expression of PETRONAS’ Group Positioning, reimagining energy™. The refreshed logo is part of a group-wide exercise to further strengthen the visual potential of PETRONAS’ corporate icon by making it more contemporary while building on the existing equity and legacy of the PETRONAS brand. PETRONAS has more than 100 subsidiaries and around 40 Joint Venture companies in which PETRONAS has at least 50% stake in the company. Although PETRONAS is considering to listing more of its subsidiaries, so far the company has listed at least 3 of its subsidiaries in the Bursa Malaysia. The company has also teamed up with local food and beverage companies, banks and transportation companies to provide better services at their petrol stations. Companies include McDonald’s, Kentucky Fried Chicken, Dunkin’ Donuts, Konsortium Transnasional Berhad, Maybank, and CIMB Bank. Involved in the provision of gas processing and transmission services to PETRONAS and its customers as a throughput company. Owns and operates thePeninsular Gas Pipeline which is 2,550 kilometres in length and runs from Kerteh in Terengganu to Johor Bahru in the South and Kangar in the North of Peninsular Malaysia. Involved in the development and the management of the Kuala Lumpur City Centre project which includes the Petronas Twin Towers, Menara Exxon Mobil andKLCC Park. Other properties under its care include Dayabumi Complex which located near Dataran Merdeka. The PETRONAS Chemicals is the latest company to be publicly listed. The IPO was done on 26 November 2010 with investor rise around US$4.40 billion, effectively become one of the largest IPO exercise in South East Asia. MMHE was listing on 29 October 2010 with MYR 1 billion raised on its IPO exercise. The business builds offshore structures for oil and gas applications, help repair large vessels and converts vessels into Floating production storage and offloadingand FSOs. E&P O&M Services Sdn Bhd (EPOMS) – Main Oil & Gas Maintenance Services – Cendor Phase 2 FPSO project, Bertam, Sepat, Layang, Gumusut-Kakap. Visible Petronas logo on the car of BMW Sauber F1. Petronas has sponsored the Formula One Malaysian Grand Prix as the title sponsor since its inaugural race in 1999. 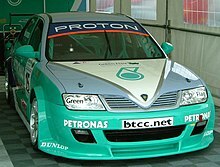 Team Petronas Syntium Proton competed in the 2002, 2003 and 2004 British Touring Car Championship seasons. Petronas has supported TOM’S, aToyota automobile racing squad inSuper GT since 2008. PETRONAS was one of the main sponsors of the BMW Sauber Formula One team alongside Intel, and it supplies lubricants and fuel to the team. It also owned 40% ofSauber Petronas Engineering, the company that builds chassis which formerly usedFerrari designed engines used by the Sauber team, until being bought out by German motor company BMW. PETRONAS is also the main sponsor for Malaysian Grand Prix, and co-sponsors the Chinese Grand Prix. PETRONAS was the exclusive premium partner of the Sauber Petronas (1995–2005) and BMW Sauber F1 Team(2006–2009). BMW had acquired the controlling stake of the former Sauber Petronas Engineering, but left the sport after the 2009 season. On 21 December 2009, PETRONAS was confirmed as moving from BMW Sauber to the newly formedMercedes Grand Prix team. In terms of further Formula One involvement, every year PETRONAS took the BMW Sauber team to various parts of Malaysia for F1 demos so the public who are unable to go to the track itself get to experience a little bit of what F1 offers. Other promotional events are held in the run up to the race and the drivers play an integral part in this so much so that Nick Heidfeld conceded that there were more fans for BMW Sauber in Malaysia than in most other countries. As part of its corporate social responsibility programme, PETRONAS also brings underprivileged children to watch the race. PETRONAS also sponsors the Malaysian Cub Prix races. It also sponsors many other sporting events and teams, mostly motorsports. Some of these sponsorships includes the PERT (Petronas EON Rally Team), the now defunct Foggy Petronas Superbike team (in which PETRONAS debutes their own superbike, the FP1), and also the Petronas Adventure Team, a 4X4 adventure team. More recently Petronas is also a major sponsor for PETRONAS TOYOTA TEAM TOM’S which is currently participating in Super GT series, which they won the team title in 2008 and driver title in 2009. The series also race in Malaysia every season at Sepang International Circuit. PETRONAS signed a three-year sponsorship agreement with Fiat Yamaha motoGP team. The PETRONAS branding can be seen startingQatar race on the 10 to 12 April 2009. Since 2010, PETRONAS is also the main sponsor of Mercedes Grand Prix team. PETRONAS awards education sponsorships in the form of convertible loans to Malaysian and international students to further their studies at local or foreign universities. The PETRONAS unit that is responsible for handling education matters is called the Sponsorship & Talent Sourcing Unit (STS). These sponsorships are awarded based on academic results, co-curricular activities, family background as well as an assessment of student personality (which is conducted throughout a program called EduCamp, which all prospective PETRONAS students are required to undergo). Students who are absorbed by PETRONAS at the end of their tertiary studies have their convertible loans converted into full scholarships. These students are under contract agreement to work for the company for two years for every one year they are sponsored. PETRONAS has its own university, Universiti Teknologi PETRONAS (UTP). Built in 1997, the campus is located in Seri Iskandar, Perak. Petróleos de Venezuela, S.A. (PDVSA, Spanish pronunciation: [peðeˈβesa]) (Petroleum of Venezuela) is the Venezuelanstate-owned oil and natural gas company. It has activities in exploration, production, refining and exporting oil, as well as exploration and production of natural gas. Since its founding on 1 January 1976 with the nationalization of the Venezuelan oil industry, PDVSA has dominated the oil industry of Venezuela, the world’s fifth largest oil exporter. Oil reserves in Venezuela are the largest in the world, and the state-owned PDVSA provides the government of Venezuela with substantial funding resources. The government of Venezuela treats PDVSA as a cash-cow, and the company only hires political supporters of the president. Between 2004 and 2010 PDVSA contributed $61.4 billion to the government’s social development projects. Around half of this went directly to various Bolivarian Missions, with the remainder distributed via the National Development Fund. Incompetence has led to serious inefficiencies and accidents. 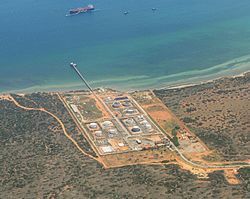 PDVSA Gas, Isla de Margarita. Venezuela has 77.5 billion barrels (1.232×1010 m3) of conventional oil reserves according to PDVSA figures, the largest in the Western Hemisphere and making up approximately half the total. This puts Venezuela as fifth in the world in proven reserves of conventional oil. By also including an estimated 235 billion barrels (3.74×1010 m3) of tar-like extra heavy crude oil in the Orinoco Belt region, Venezuela claims to hold the largest hydrocarbon reserves in the world. Venezuela also has 150 trillion cubic feet (4.2×1012 m3) of natural gas reserves. PDVSA has a production capacity, including the strategic associations and operating agreements, of 4 million barrels (640,000 m3) per day (600,000 m³). Officials say production is around 3.3 million barrels per day (520,000 m3/d) although most secondary sources such as OPEC and the EIA put Venezuela’s output at least 500,000 barrels per day (79,000 m3/d) lower. In 2006, Rafael Ramírez, the energy minister, gave PDVSA workers a choice: Support President Hugo Chávez, or lose their jobs. The minister also said: “PDVSA is red [the color identified with Chávez’s political party], red from top to bottom”. Chávez defended Ramírez, saying that public workers should back the “revolution”. He added that “PDVSA’s workers are with this revolution, and those who aren’t should go somewhere else. Go to Miami“. PDVSA purchased 50% of the United States gasoline brand Citgo from Southland Corporation in 1986 and the remainder in 1990. In December 2002 the Venezuelan general strike of 2002-2003 saw many of PDVSA’s managers and employees (including the CTV trade union federation) lock out workers to pressure Venezuelan president Hugo Chávez to call early elections, and virtually stop oil production for 2 months. 19,000 employees left their jobs and the government reestablished production with employees loyal to the Chávez government. The International Labour Organization (ILO) called on the Venezuelan government to launch “an independent investigation into allegations of detention and torture”, surrounding this strike. The strike caused substantial macroeconomic damage, pushing unemployment up by 5% to a peak of over 20% in March 2003. The company has since formed its own militia, which all employees join on a voluntary basis, to ward off a potential “coup” by the government. It considers itself virtually indistinguishable from the state, its social programs more or less running the country’s socialist revolution. 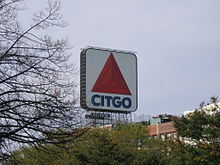 In November 2005, PDVSA and its subsidiary in the US, Citgo, announced an agreement with Massachusetts to provide heating oil to low income families in Boston at a discount of 40% below market price. Similar agreements were later set up with other states and cities in the US Northeast including New York’s Bronx,Maine, Rhode Island, Pennsylvania, Vermont and Delaware. Under the program, Citgo offered a total of around 50 million US gallons (190,000 m3) of heating oil at below market prices, equivalent to a discount of between 60 and 80 cents a gallon. On 28 July 2006, credit ratings agency Moody’s Investor Service said it was removing its standalone ratings on PDVSA because the oil company does not provide adequate operational and financial information. PDVSA has still not filed its 2004 financial results with the US Securities and Exchange Commission that were due in June 2005. In 2007, PDVSA bought 82.14% percent of Electricidad de Caracas company from AES Corporation as part of a renationalization program. Subsequently the ownership share rose to 93.62% (December 2008). PDVSA has made contributions to the protection of the environment through showcase projects in shanty towns and waste removal. PDVSA is Latin America’s third-largest company, according to the a ranking of the region’s top 500 companies from Latin Business Chronicle. In 2010, PDVSA loaned the government of Antigua $68 million to repurchase all remaining shares of West Indies Oil Company (WIOC) from Bruce Rappaport‘s National Petroleum Ltd. In 2012, PDVSA announced that it would enter into a joint venture agreement with Eni SpA and Repsol in order to initiate a gas production project at the Cardon VI gas block in Venezuela. Production from this joint venture is estimated to reach between 80-100 million cubic meters of gas. In February 2014, PDVSA and the Anglo-French oil firm Perenco entered into talks for a $600 million financing deal to boost production at their Petrowarao joint venture. In October 2014, Venezuela imported its first ever ship of oil from Algeria so that they could dilute their oil. Assets of ExxonMobil and ConocoPhillips were expropriated in 2007 after they declined to restructure their holdings in Venezuela to give PDVSA majority control,Total, Chevron, Statoil and BP agreed and retain minority interests in their Venezuelan projects. Arriving at a settlement with ExxonMobil has proven difficult with Venezuela offering book value for ExxonMobil’s assets and ExxonMobil asking for as much as $12 billion. This and a number of other matters including the claims of ConocoPhillips remain before the World Bank’s International Centre for Settlement of Investment Disputes. PDVSA has paid compensation for assets it has nationalized including $255 million paid to ExxonMobil on February 15, 2012 in compensation for nationalization of ExxonMobil’s Venezuelan assets in 2007 and $420 million to be paid beginning in 2012 to U.S. firms Williams Cos Inc. and Exterran Holdings, Inc. for natural gas assets nationalized in 2009. There have been worsening safety problems since 2003, culminating in a gas leak at the Paraguaná Refinery Complex in August 2012 which caused an explosion, killing 48 people and damaging 1600 homes. Another major fire broke out at the El Palito refinery in September 2012. Rafael Ramírez (2004 – 2014) Minister of Energy and Oil (2005), M.Sc. Energy policy – UCV, B.Sc. Mechanical Engineering – ULA. Alí Rodríguez Araque (2002–2004) Minister of Energy (1999), Secretary General OPEC (2001), Lic. Economics – UCV. Gastón Parra Luzardo (2002) Academic Vice-Rector – LUZ (1980–1984), Dean of the School of Social Sciences – LUZ (1972–1975). Lic. Economics – LUZ. Héctor Ciavaldini (2000 – October 2000). Gustavo Roosen (1992–1994) Minister of Education (1989), M.A. Comparative Law – New York University (NYU), B.A. Law – UCAB. Brigido R. Natera (1984–1986) B.S. Geology, Universidad Central de Venezuela, 1942, M.B.A. Stanford University, 1968. Humberto Calderón Berti (1983–1984) Minister of Energy (1979–1982). Citgo Petroleum Corporation, USA – Citgo is 100% owned by PDVSA. Nynäs Petroleum, Sweden – PDVSA owns a 50% stake with Finland’s Neste Oil Oyj holding the other 50%. Hovensa LLC refinery, US Virgin Islands – Hovensa is jointly owned by PDVSA and Hess Oil Virgin Islands Corp.
Isla refinery, Curaçao – PDVSA leases the Isla refinery on the island. Ruhr Oel, Germany – PDVSA was a 50% owner of Ruhr Oel GmbH, the other half belonging to BP‘s German unit Aral AG. PDVSA sold its part to Russia’s Rosneft on October 2010. PDVSA also has offices in Argentina, Bolivia, Brazil, Colombia, China, Cuba, Spain and Netherlands.